An evening rainstorm didn’t stop Hillcrest School from opening the first all-accessible public school playground in DuPage County on Aug. 17. In fact, just as the red ribbon was cut, a beautiful rainbow appeared across the sky! “Owen’s Playground” is the result of a two-year collaborative community effort led by Hillcrest Parent Peg Chaidez. The playground is named after Chaidez’s son who served as inspiration for the project. With support from District 58, Chaidez led a large crowdfunding effort to secure funds for the project. Chaidez created the Dream Build Play Experience organization in fall 2014 and partnered with Abide In Me to serve as the fundraiser’s fiscal partner. 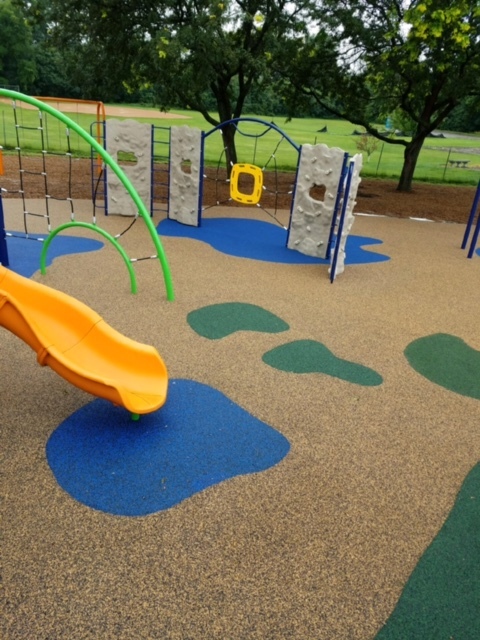 With financial contributions from the Ronald L. McDaniel Foundation, Barbara Gulick and many private donors, they raised $600,000 to make the universally-designed playground a reality. Principal Michelle Rzepka led Wednesday’s grand opening ceremony, with remarks from Peg Chaidez, architect Mike Maloney and Rep. David Olsen. Superintendent Dr. Kari Cremascoli and major playground donors Ronald L. McDaniel and Barbara Gulick also contributed to the grand opening ceremony. Chaidez’s son, Owen, and his siblings and friends officially cut the red ribbon to open the playground to the excited cheers of children and parents in the crowd. District 58 and Peg Chaidez thank everyone who helped make Owen’s Playground a reality, including the Ronald L. McDaniel Foundation, Barbara Gulick, Abide In Me, Gerard Agency, BCI Burke Playgrounds, Rosemarie and Dean L. Buntrock, Hillcrest School, 100 Women Who Care, Spindler Family, Champions Before and After School Program, Downers Grove Junior Woman’s Club, E-M Designs, Fresh Thyme Farmers Market, Friends of Billy Rogers, Tina Kiker, Whitney Murphy, Friends of Noah and Laine VanHoutan, Ashley and Nicholas Chavez and many more. The Downers Grove Chamber of Commerce provided the giant ceremonial scissors for the ribbon-cutting. Wolf Pack Development Group, Thomas Crnkovich and Michael Nelson provided project engineering and survey services for the playground. Michael Maloney provided landscape architect services. For more information regarding Owen’s Playground and the efforts to build it, visit www.dbpexperience.com.